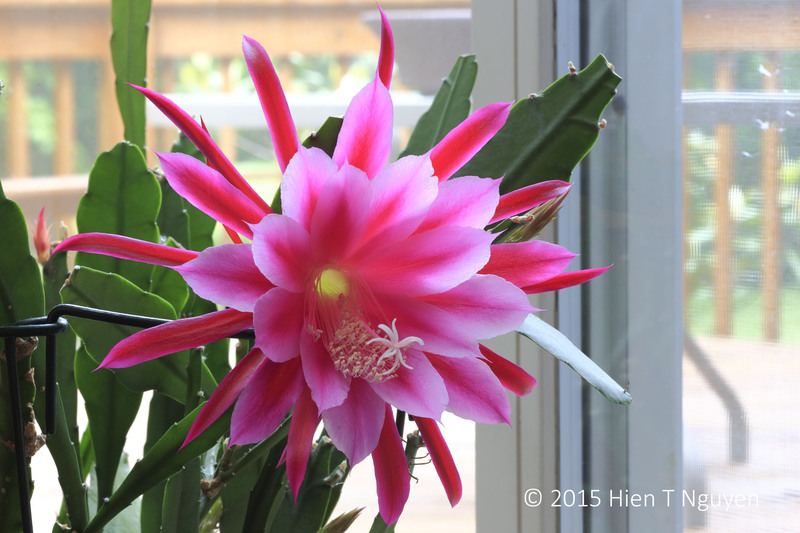 That cactus flower is the very definition of the word vivid! Nicely shot as well! Very beautiful vivids of nature! Wow 20 years and still blooming?! You must have quite the green thumb! Beautiful shots. Gorgeous flower- it’s also very intricate and fits the bill for the earlier challenge a few week ago! Agree, beautiful, vivid and great detail. The texture of the white star like flower at the end reminded me of pipe cleaner. Great photo! That star like stigma at the end of the style is where pollen should be. It does look like a pipe cleaner! 🙂 Thank you for visiting and commenting. The flower is indeed enormous. 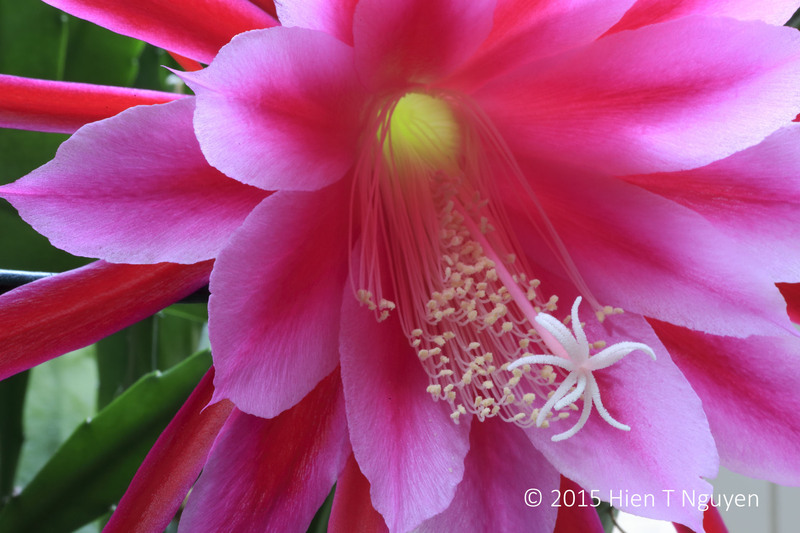 We have a similar cactus which produces a flower just as large, in white, with a sweet smell. But the flower only blooms at night and lives just a few hours. Thank you for commenting. Very beautiful. How wonderful to have that blooming plant in your house. Thanks John! Do you have this kind of cactus in your area? I’ve not seen that cactus in this area but the ones we have are blooming. I have never seen cactus flower this beautiful! 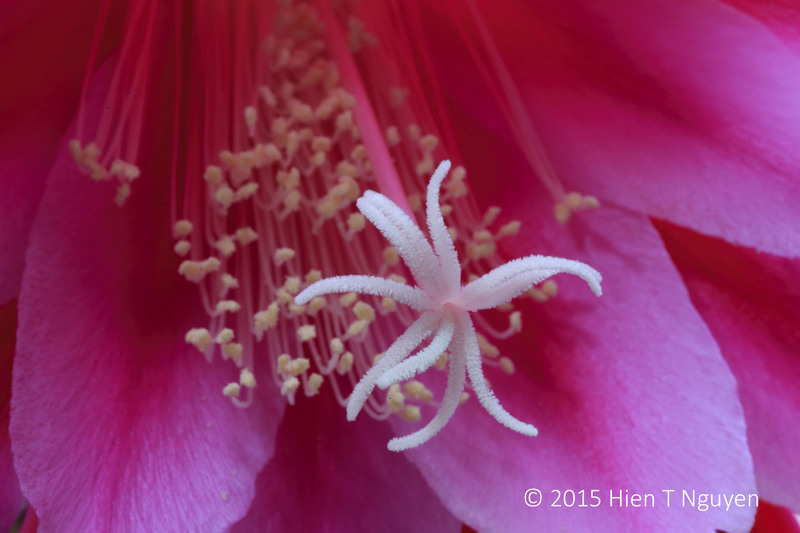 Great capture, Hien!